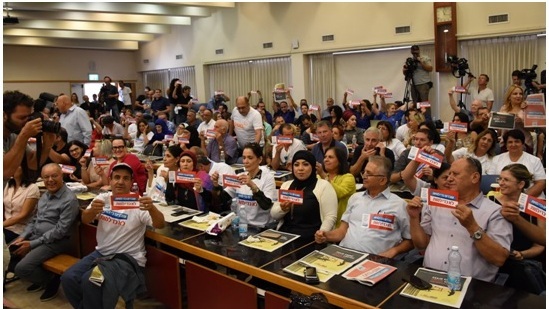 Histadrut General Federation of Labor in Israel chairperson Avi Nissenkorn announced on Thursday that a general strike will take place on Wednesday, November 7, in response to governmental inaction over the increasing toll of construction site accidents in Israel. From the beginning of 2018, 37 construction workers have died and 191 have been injured – 38 of them seriously – in on-the-job accidents at building sites. In 2017, a total of 35 construction workers died and 264 were injured. The labor federation chief cited a list of strike participants that includes the Magen David Adom ambulance service, the Tel Aviv Stock Exchange, the Nuclear Research Center in Dimona, Israel Aerospace Industries, the universities, Ashot Ashkelon Industries, government ministries, public and local authorities, banks, transport services, the Airports Authority. They will be joined by a range of major private sector unions. Hundreds of work committee members and leaders of large unions and other organizations took part in the last Thursday’s conference. Three weeks ago, Histadrut institutions authorized the opening of a general labor dispute. This announcement was preceded by Nissenkorn’s appeals to government ministries and employers to reach a consensual collective arrangement for regulating safety in workplaces, with an emphasis on stopping fatalities in the construction sector. Since the legal cooling off period has expired and decision-makers and employers have proposed no practical steps to redress the situation, the Histadrut is preparing for a full shutdown of the economy. In recent days the Histadrut published a list of demands for safety regulations in the construction sector, including making the European standards for scaffolding binding, enforcing the obligation to wear safety harnesses, regulating the use of cranes on construction sites, and adding a mandatory safety appendix to state construction and infrastructure tenders.